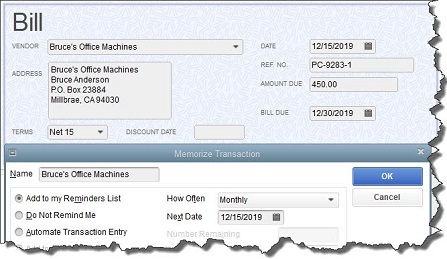 QuickBooks Tip: Are You Memorizing Transactions? Should You Be? You know that QuickBooks saves a lot of time. But have you explored how it does so by memorizing transactions? Before you can Memorize a transaction, you first have to create a model (template) for it. Automate Transaction Entry. Be very careful with this one. It’s reserved for transactions that are identical except for the issue date. They don’t need your approval – they’re just created and dispatched. Obviously, you’ll want advance warning of transactions that will require processing. QuickBooks lets you specify how many days’ notice you want for each type. Open the Edit menu and select Preferences. Click Reminders in the left vertical pane, then the Company Preferences tab. You can tell QuickBooks whether you want to see a summary in each category or a list, or no Reminder. Then you can enter the number of days’ warning you want. QuickBooks lets you specify the content and timing of your Reminders. Anytime you’re letting QuickBooks do something on its own, it’s critical that you thoroughly understand the mechanics of setting the process up. We’d be happy to go over the whole topic of Memorized Transactions with you, or any other aspect of QuickBooks operations. https://tarlow.com/wp-content/uploads/2016/05/logo.png 0 0 Joanna Castle https://tarlow.com/wp-content/uploads/2016/05/logo.png Joanna Castle2017-04-14 17:19:402017-04-14 17:19:40QuickBooks Tip: Are You Memorizing Transactions? Should You Be? Starting a new business is one of life’s most exciting adventures. However, in order to build a successful company you need to start turning a profit as soon as possible. In the beginning of any business, expenses are unavoidable, but you can increase your profits by minimizing these expenses as much as possible. Here are eight tips you can use to save money while building your startup company. As a new business, you want to attract the best employees to your company. However, trying to offer the same perks as a venture capital startup can put you in debt quickly. Many successful businesses started in a garage, and there is no shame in keeping things simple at first. Once you’ve made it, you can start thinking about adding cappuccino machines, ping pong tables, and other perks to your office environment. As you work to grow your business, you may need a variety of services from independent contractors or other companies. Instead of offering to pay cash for the services you receive, try to offer a different type of benefit that won’t impact your bottom line as much. For example, you may offer some of your own products or services, or you may allow the other party to collect a small amount of the profits you earn because of their services. Recruiting new employees can be expensive, especially if you are determined to find the best people. To cut down on these costs, consider using LinkedIn to recruit new people for your startup. Although you will have to do some of the legwork, you won’t spend as much as you would with other recruiting strategies. Regardless of the steps you take to save money as your business grows, you will still need to manage your funds carefully to ensure that your financial situation is improving over time. A professional accountant can help you set up a realistic budget and cash flow forecast to keep you on the right track. Contact our office today to learn more. Just a reminder to those who have not yet filed their 2016 tax return, the tax filing deadline is April 18, 2017 — to either file your return and pay any taxes owed, or file for the automatic six-month extension and pay the tax you estimate to be due. The due date is normally April 15, but the 15th falls on a weekend and the next business day, April 17, is Emancipation Day, a legal holiday in Washington D.C., so the due date in 2017 is April 18. There are certain tax deductions for owner-operator truckers that are unique. You benefit from special allowances for meals, are allowed very large write-offs for tractors and other equipment, must pay additional taxes and permit costs, and may have special reporting requirements in addition to your tax returns. The following is an overview of the tax issues that may apply to owner-operators. Meals are deductible if you need to stop for substantial rest in order to properly perform your duties while traveling on business. Lodging – Lodging expenses are deductible. Unfortunately, there is no standard allowance for lodging; thus, you must keep a receipt for each lodging expense. Generally, to deduct lodging expenses, you must be away from home overnight. One issue that could result in the disallowance of lodging and other travel expenses is not having a regular place of business or place of residence. In this case, you would be considered an itinerant (or transient), and your home for tax purposes would be wherever you work. As an itinerant, you would not be able to claim a deduction for lodging and meals because you would never be considered to be away from home. Other On-The-Road Expenses -Generally, to be deductible, items must be both ordinary and necessary to your job. For truckers, these expenses include laundry (when away overnight), gloves, logbooks, maps, cell phones, CB radios, tools, safety gear, cargo straps, and any other incurred expenses that are ordinary and necessary in the business. Generally, receipts are required, but if the business expense is less than $75, a receipt is not necessary, provided that you record all of the information in a diary in a timely manner. Vehicle (Tractor) Cost Write-Offs – The current tax code provides several options for writing off the cost of a vehicle, including immediate expensing of up to $510,000 (as of 2017) during the year the property is put into service; first-year depreciation equal to 50% of the vehicle’s cost; normal deprecation; or a combination of all three. These options allow owner-operators to pick almost any amount of write-off to best suit their particular circumstances. For normal depreciation, the IRS allows a recovery period of 3 years for over-the-road tractor units and of 5 years for trailers, trailer-mounted containers and heavy-duty trucks (13,000 pounds or more). Vehicle (Tractor) Operating Expenses – Of course, vehicle operating expenses – including fuel, licenses, taxes, maintenance and insurance – are deductible. Depending on the nature and cost, some expenses may have to be depreciated. General Business Expenses – Owner-operators can usually deduct the following expenses: trucking-industry and business-related subscriptions, association dues, computers and software, Internet service, cleaning supplies, business interest, office supplies, DOT physicals, drug testing, sleep apnea studies, postage and other business-related expenses. Heavy Highway Vehicle Use Tax – The heavy highway vehicle use tax (Form 2290) applies to highway vehicles weighing 55,000 pounds or more. The due date for this form is based on when (during the annual filing period) the vehicle is first used on a public highway. For the period of July 1, 2016, through June 30, 2017, Form 2290 is due by the end of August 2016 for vehicles first used on a public highway in July 2016. For vehicles first used on a public highway after July, the use tax is prorated, and the form is due by last day of the month following the month of first use. See when to file for more details. The use tax ranges from $100 to $550 per vehicle for a full year, depending on the vehicle’s weight. You will need to have an employer ID number to file the Form 2290; your Social Security number cannot be used as the ID number. Subcontractor Payments – If you paid an individual for services during the year, that person was most likely a subcontractor. Payments of $600 or more to subcontractors must be reported to the government by filing Form 1099-MISC. This form requires the subcontractor’s name, address and tax ID number as well as the payment amount. There are penalties for failing to file this form, for filing it late and for filing it without the tax ID number. All these penalties can be avoided by (1) having contractors complete Form W-9 before you pay them and (2) filing the 1099-MISC forms by January 31 of the subsequent year. Some expenses are not deductible; those with limited knowledge of trucker expenses may take these deductions, potentially triggering IRS inquiries and audits. One example is deducting the cost of street clothing. For clothing, only the cost of uniforms or protective clothing is allowed as a deduction. Lost income is already accounted for, as you do not have to report the income on your tax return in the first place. If you have any questions related to trucking and taxes, please call. This office is knowledgeable regarding the drivers’ and owner-operators’ tax issues, and are here to help you eliminate the stress of accounting and tax filing. If your 2016 federal return has already been filed and you are due a refund, you can check the status of your refund online. Notice that the IRS has been unable to deliver your refund, on account of an incorrect address. You can update your address online using the “Where’s My Refund?” feature. “Where’s My Refund?” also includes links to customized information based on your specific situation. The links guide you through the steps to resolve any issues affecting your refund. For example, if you do not get the refund within 28 days from the original IRS mailing date shown on “Where’s My Refund?,” you can start a refund trace online. If you have questions related to your refund, please give this office a call.